People have been captivated by the mighty gas giant Jupiter for centuries, with its powerful swirling clouds and the iconic glowering red eye… really interesting, but we’ve no idea what lies beneath those colorful cloud layers, until now! Just a month before the imminent visit of NASA’ Juno spacecraft to the gas giant (set on July 4, 2016), astronomers manage to cut through Jupiter clouds and revealing what’s happening down below. By using the new upgraded version of the Very Large Array (VLA) radio telescope in New Mexico, researchers have produced radio maps of planet’s thick clouds down to 60 miles (100 km) depth in unprecedented detail, and finding patterns of poisonous ammonia-rich gasses just beneath. said Imke de Pater ~ lead author on the new work published this week in Science. 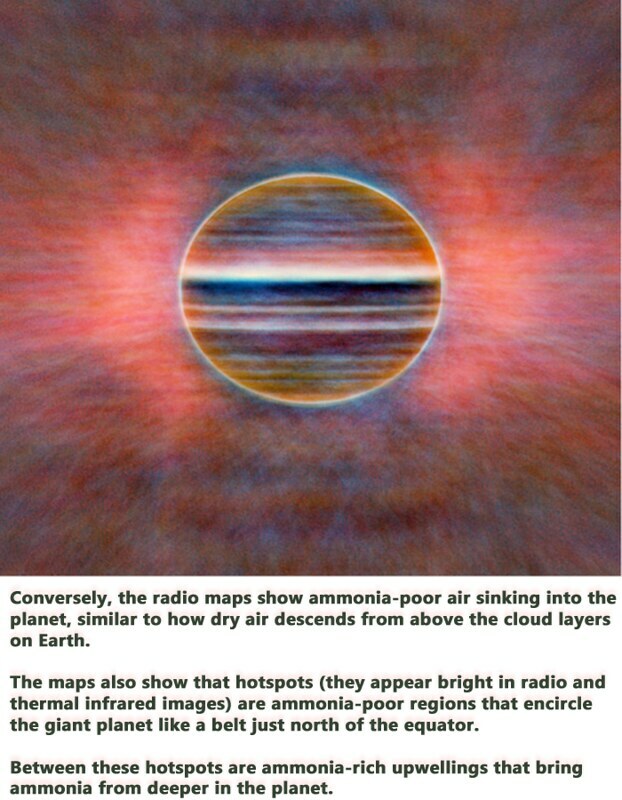 Transition from optical image of Jupiter to new radio map ©Radio: Robert J. Sault (Univ. Melbourne), Imke de Pater and Michael H. Wong (UC Berkeley). Optical: Marco Vedovato, Christopher Go, Manos Kardasis, Ian Sharp, Imke de Pater. Previous Jupiter’ radio maps have been limited to analyzing its properties at specific latitudes, however those new maps reveal more details about atmosphere’s temperature, pressure and gas motions. team-member Michael Wong told BBC News. In our maps you can see different zones, turbulent features, vortices – even the Great Red Spot. This has all been made possible by an upgrade to the VLA and a new technique developed by one of our co-workers. Thermal radio emissions of the planet are partially absorbed by ammonia gas. Based on the amount of absorption, researchers could determine how much ammonia is present and at what depth. Astronomers saw that ammonium-rich gases rising to form a toxic ammonium hydrosulphide cloud at -100°F (-73°C) and a cloud of ammonia-ice crystals at -148°F (-100°C). These clouds are easily seen from Earth by optical telescopes. If you reference or cite optical telescopes you should tell us which ones. All such assets are taxpayer supported, and taxpayers have a right to know who is doing what. Please provide to me a list of the optical telescopes that you noted in your piece. It says it in the first line of the third paragraph.